I thought i would bring you some notes on the Raspberry Pi and the power required. I currently have bought a power supply from RS components that works really well, it outputs 1200mA at 5 volts. I also bought a power supply from e-Bay for the Raspberry Pi, it outputs 1000mA at 5 volts. this also works well and runs the Pi without any problems. 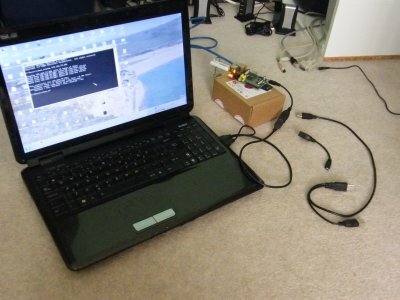 OK I thought lets try from a PC USB port so connected my Pi to the USB port on my laptop using a Nokia USB to micro usb cable. The Pi starts up and displays through the RCA port that I use to connect to my TV, but the PI USB port will not work so the keyboard doesnt do anything, this is probably due to the fact that most USB ports are limited to outputting 500mA per port. So my next attempt was to use a dual USB to single USB cable that came with a USB hard disk drive housing. This fits the PC fine, but the USB at the PI end is a Male full size one so it doesnt fit the PI. Right I am now going to buy a Samsung Galaxy S11 USB female to micro USB male that will fit the PI. I have laid out a further two cables to the right of the laptop unconnected so you can see what they look like. As you probably cant see from the picture, in actual case the Pi is running fine, the twin to one cable allows about 1000mA to the Pi and it works fine with the USB ports running connected to a USB disk drive. If you look at the Pi Specifications it says power required 700mA so all the 3 above solutions provided adequate power to make the Pi run. I had one failure - I bought a very cheap powered USB port (about �3.50) from e-Bay, and even with the double cable, the Pi would only just start up, so this one doesnt produce enough power via 2 usb ports to power the Pi. So my recommendation is to buy a 5v power supply with at least 1000mA to run the Pi, as running from the USB ports on a laptop will limit movement with the laptop, unless you are running the Pi with a wireless interface.